I just bought a cheap $25 bright yellow soprano ukulele (21") at a music trade show a couple of weeks ago, and I am totally in love with this tiny thing. I've never played a ukulele before -- I'm a long-time amateur guitar player-- but it's a complete BLAST to play, and not hard to learn the chords. I'm currently working on "You belong to me" from The Jerk. Anyway, we've booked summer flights for Ireland and Italy to meet up with my brother's family, and I'm thinking I should definitely bring the ukulele. I bet my young nieces will love playing it. I know a few of you are ukulele players... have you taken yours overseas just for the fun of it? I was thinking about strapping mine onto the outside bungie cords of the Smart Alec, wedging it into the Aeronaut 30 (it just fits if I unzip both end pockets), or sticking the neck through the outside handles of the Aeronaut. If it's strapped to the bag, does it count as a single bag? Aren't there special dispensations for bringing a musical instrument on a plane? I wonder if I could get it on for free as a "therapy instrument" (like a therapy pet). Ha! I carried my small, travel dulcimer in a ukulele case when flying across country last Christmas. I did hit gate one gate agent who insisted that it counted as a third item (along with my Aeronaut and Pilot) and wasn't allowed. Fortunately, I had looked up the official fine print on musical instruments for that airline and stood my ground (said fine print said that a musical instrument plus the usual carryons were allowed). My advice is to go online for whichever airlines you are flying and see their rules on musical instruments. It isn't uniform across all airlines. In the states, airlines are required to let you bring one on board, if there is room in the overheads, but actual practice does vary. My dulcimer websites have threads on this topic fairly frequently--you may want to check out some ukulele forums too. BTW, my soft-sided uke case fit under the seat of all my flights quite easily. Funny you should mention that you're looking for a solution to traveling with a ukulele and your Smart Alec, Amy. Just a few days ago, I was replying to @KmK's Augh, decisions! thread about canvassing opinions for choosing alternate colors (Aubergine vs. Verde), and a Google search for references to "Aubergine as a neutral color" (in some Swift discussions) brought me to one of Amy Singer's Knitty blog pages. Most of the blog page is about working with Tom to design items like the Kinitting Tool Pouches, but there's the following comment about Darcy finding a way to rig a ukulele to her (Aubergine) Smart Alec, along with a short Vine video clip. I'm on an iPad, so I don't think I can embed the Vine segment, which does play when I try it on the iPad in Safari, but I'll quote the relevant section and embed a snapshot from the video sequence. (You can obviously check the linked blog page directly for more information). One of my favorite ah-ha moments of the weekend came when Darcy figured out we could remove the (unused by me) waist strap from my Smart Alec backpack and, using the existing straps inside the bag, turn it into a cinch for my ukulele’s neck! This keeps the uke snug against the back of the backpack, in a vertical position, and allows the zippers to snug up at the top, exposing as little of the uke as possible. And leaves tons of room in the bag for all your other stuff. @Yokosmom - Thanks for the info. Did you print out the guidelines for instruments to bring with you on the plane as proof? I am hoping mine will be tiny enough to qualify as part of my bag. @Moriond - thanks for that link. I like the tip of using the waist strap to secure it inside the bag. Mine is quite a bit smaller, so I can *just* manage to zip the Smart Alec all the way up when my ukulele is in it, against the back wall. But I worry that it might be putting too much stress on it if I fill the bag with other stuff. (I only have a thin, unpadded case). I'm going to experiment a bit with that. Amy I did have the rules all printed up and was ready to whip them out, but the gate agent ended up going to her supervisor who apparently told her to wave me through. Whether that was because the supervisor thought it wasn't worth the trouble of arguing with me, or whether she really set the agent straight on what was allowed, I don't know. At any rate, I knew what the rule was and was prepared to be obnoxious about it. However, I think that the idea of just attaching it to a Smart Alec or other bag is a good idea--you are bound to get less flack over doing it that way. But you should know the rules for musical instruments at any rate--just in case you run into a problem. My case doesn't fit into my Aeronaut--even with the inside side panels let out, it's about an inch or so too long. Off topic, but this is a great title for a short story! Not about bags, and I don't play or travel with a ukulele, but for those forum members who are not familiar with the performances of Jake Shimabukuro in all his diverse styles, it's worth checking out the various YouTube videos, PBS and NPR video programs, TED, videos, etc. That guy is just amazing on the ukulele. @moriond, I discovered him while searching for YouTube tutorials on ukulele. Absolutely astounding. I took my uke to a sandy play area yesterday with the grandkids, strumming on a bench while they made sand castles. It embarrassed my husband, son and daughter in law, but my grandkids loved it, I got a lot of smiles from the other parents, and one lady came up to me, intrigued, and told me, "that is so awesome!" If I lived in Austin, I am certain that nobody would think twice about seeing someone whipping out a ukulele. But in Dallas, you just look like a nut. Not that I really care, because it is impossible to feel bad when you are strumming a tiny yellow ukulele. 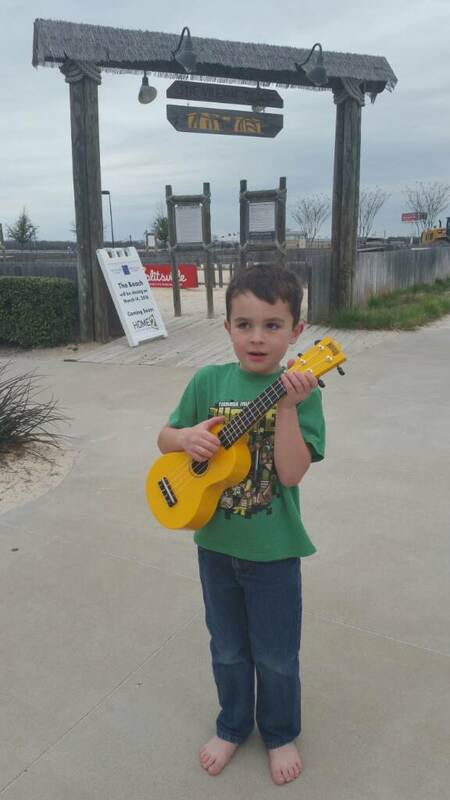 Here is a pic of my grandson, age 5, who loves my ukulele and wants me to order him a red one. Last edited by Amy; 03-07-2016 at 06:57 PM. Traveling with a musical instrument in the cabin is up to the individual airline. There is no law stating they have to let you carry it specifically. Most airlines will allow it as part of your carry on as long as it either fits in the overhead or under the seat in front of you. If the flight is full and there is no room, one of your carry-ons is going to get checked. And remember flights within Europe are much stricter when it comes to carry on bags than in the U.S. Check with your airlines. By the way, for general knowledge, there is no law stating how many bags the airlines must allow you to carry on. They are more concered on what you can't take on board. As long as the bags can be stored in either the overhead compartments or under the seat in front of you, airlines are permitted to make their own rules. As an example, Spirit only allows one small carry on bag for free while Southwest allows one up to 24 x 16 x 10. In the U.S., medical equipment is allowed on board as an additional bag. Musical instruments don't fall under that category even if you think they are a therapy instrument. Musical instruments don't fall under that category even if you think they are a therapy instrument. Even if I call it "Wilson"? Thanks for the info, Frank. I tested my ukulele in several bags yesterday, and my current plan is to bring all my clothes in the A30, and the ukulele in the daylight backpack outer pocket, leaving the rest of the daylight backpack for my laptop and plane stuff. We have 1 one-way flight on BA, and it looks like they count instruments against your baggage allowance. So I will make sure to put the ukulele in my DLBP, not carry it loose. It extends a few inches above the height of the DLBP, but it is pretty unobtrusive when carried that way and I am pretty sure will still qualify as my personal item. Traveling with a musical instrument in the cabin is up to the individual airline. There is no law stating they have to let you carry it specifically. "The rule requires that each U.S. carrier subject to this regulation allow a passenger to carry into the cabin and stow a small musical instrument, such as a violin or a guitar, in a suitable baggage compartment, such as the overhead bin or a closet, or under the seats, in accordance with FAA safety regulations and the carrier’s FAA-approved carry-on baggage program. Carriers must allow passengers to stow their small musical instruments in an approved stowage area in the cabin if at the time the passenger boards the aircraft such stowage space is available. Under the rule, musical instruments as carry-on items are treated no differently from other carry-on items and the stowage space should be made available for all carry-on items on a “first come, first served” basis."" You are correct that airlines can decide whether the small musical instrument is viewed as part of the stipulated online carryon luggage items or if it can be included in addition to the normal carryon number of items. The airline that I traveled with allowed a small musical instrument in addition to the normal 2 carryon items. All airlines will allow you to carry a small instrument if it meets its carry on rules. It doesn not, as you point out, have to let you carry it on as additional baggage. As long as the item you want to bring is not banned by the TSA or dangerous, you can bring it as long as it fits the airline's carry on baggage regulations. I think your airline, whichever it was, is the only one I've ever heard of that allows it as a third item. Amy....are you aware that BA limits the size of the personal item you are allowed to carry on board? It's 16" x 12" x 6". Your ukulele and DLBP are going to be over that. You may get it on and you may not. Be prepared to check your A30. You should also check the other airlines you are flying to see their rules. More and more airlines are starting to limit the size of the personal item. Last edited by Frank II; 03-08-2016 at 08:20 AM. - Personal item: Daylight Backpack, filled with remaining clothes and computer. This would mean that both carry on and personal item would be within the size limits of BA. RE: Amy - "But in Dallas, you just look like a nut." I'm in Fort Worth, so I totally get that! Amy....a little trick with the DLBP...if the top of the bag isn't filled, it will flip over a little to make it fit into sizers. BA's long size dimension is 16", the DLBP is 17", but with the "flip," it fits easily. And even United has personal item size limits of 17 x 10 x 9 so your thought of putting the uke in the A30 is a good one. I also thought of taking a uke with me on my travels but decided against it.